Zerto Virtual Replication 2.0 wins the Gold in the Storage magazine/SearchStorage.com 2012 Products of the Year competition. Zerto Virtual Replication 2.0 garnered gold in the data backup and disaster recovery software and services category in Storage magazine's/SearchStorage.com's 2012 Products of the Year competition. Read about all the winners in our guide to the best storage products of 2012. Zerto Virtual Replication (ZVR) 2.0 is a hypervisor-based replication product that enables replication from a VMware vSphere environment to a VMware vCloud environment, and vice versa. 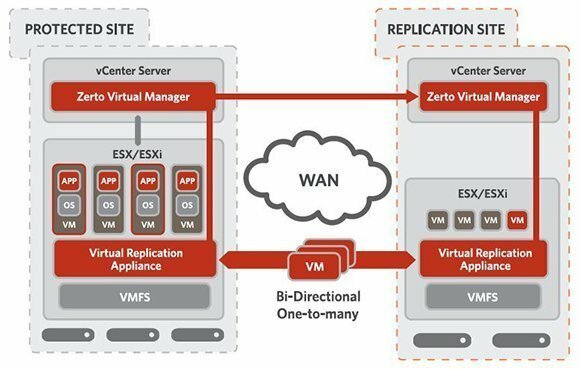 Version 2.0 of Zerto Virtual Replication is hardware-agnostic, and offers multisite replication, off-site cloning and backup with support for virtual machine (VM) boot order and automatic updates of VMware vApp changes. Full integration with VMware vCloud Director is offered, as well as full awareness of VMware vMotion, Distributed Resource Scheduler and High Availability. Because the product is hardware-agnostic, users can set up different tiers of storage, repurpose older storage and mix storage vendors. Multisite replication allows users to protect their main data center and remote offices; data can be replicated from any site to any site or from many sites to one shared infrastructure. Virtual Replication 2.0's off-site cloning and backup lets users create copies of VMs for testing, backup or development without any impact on the production environment; the product's journal can now store up to five days of data to protect against corruption. Another new feature, infrastructure masking, allows administrators to limit access to parts of the infrastructure for security. Full integration with vCloud Director enables replication from vSphere to vCloud and offers multi-tenancy for cloud environments, which ensures separation of department or customer data within a shared infrastructure. In the past, multiple instances of vCenter were necessary for multi-tenancy, which increased cost and complexity. Zerto Virtual Replication's centralized management saves users from having to switch back and forth between vCloud Director and vSphere consoles. "The big advantage is that we can have any kind of storage now," said Tamas Nemeth, a Zerto user and IT manager with logistics firm Transfreight Inc., in an October article published on SearchDisasterRecovery. "And because it's on the hypervisor level, we don't have to use VMware vCenter Site Recovery Manager [SRM] or other third-party tools to fail over. ZVR doesn't just fail over storage, it fails over the virtual machine too." One of our judges said the product took an "interesting and fresh approach for an important new environment." Another said Zerto Virtual Replication 2.0 was a "highly innovative, simple alternative to SRM" and called the VMDK-awareness "ingenious." Find out the other winners in the Backup and Disaster Recovery Software and Services Category.